Central Air Conditioner Problems: In previous Blog Posts, we have discussed proper maintenance of your HVAC system. If you are doing that, breakdowns will be notably reduced. However, Central Air Conditioners will stop working due to problems or components that wear out and fail, and not related to maintenance. 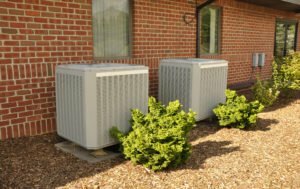 There are some common Central Air Conditioner Problems most homeowners can check and correct themselves. NOTE: After Home Owner Correctable Problems, We Provide A List Of Problems Which Need To Be Repaired By An HVAC Technician. Thawing the cooling coil (inside the furnace). Beyond These, We Don Not Recommend Nor Instruct Home Owners How To Do A/C Repairs. You may create bigger problems, injure or kill yourself. High electrical voltage exists inside a Central A/C System, creating shock or electrocution potential if not correctly handled during repairs. HVAC Technicians are trained to troubleshoot your air conditioner, determine the problem, then perform repairs with the correct part and installation method. 7 Home Owner Correctable Problems. GAS Furnace Main Shut Off Switch Is Turned Off . This switch accidentally getting turned off is one of the common central a/c problems. This switch shuts down the entire system. This switch is located on or near the GAS furnace and must always be turned on. NOTE: It’s easy to bump this switch when changing the air filter. Also, curiosity may temp a child to turn the switch off to see what happens. This switch will be mounted on the furnace, or within reach of it. It will look like a regular light switch. In most cases it will be mounted inside a metal box=. ELECTRIC Furnace Main Shut Off Circuit Breaker (near the furnace) has tripped or is turned off has a is a circuit-breaker on or near the inside unit. The breaker shuts down the entire system. As with many breakers, it may be tripped but not appear to be. Flip the breaker to off, then back on to reset it. The Main Shut Off for electric furnace will look more like a circuit breaker panel switch. It will be mounted on or within reach of the furnace. Tripped Circuit Breaker (inside the Circuit Breaker Panel). Flip Breaker All The Way Toward Off & Flip Back To On. NOTE: Beakers Often Trip Only Partially. This May Make It Look As If It’s On. Blown Fuse In Outside Fuse Box (near the outside a/c unit). This may be the problem in older homes with fuse-boxes. (NOTE: It’s The Gray Box Just Above & To The Right Of The A/C Unit). Before central a/c problems repairs begin, the outside disconnect box is shut off to protect a/c service technicians. If the primary breaker or fuse (inside the home) is not within view, Building Code requires the disconnect box be present to prevent electrical-hazard to a technician in the event someone turns the breaker inside the home back on. Additionally, these fuses provide another degree of protection for the outside unit. Outside fuses are used for overload protection. These fuses are typically sized to the specific load they protect, and may be a lower size than the circuit breaker in the main breaker-box . If a fan or compressor cannot spin (most newer a/c compressors spin to compress refrigerant) it will quickly overload, overheat, and burn up. The fuses in the a/c disconnect prevent this from happening. Note: Never put a higher rated fuse (than is specified) in the outside disconnect box. The larger fuse will allow the a/c to damage itself, instead of blowing to prevent it. Not All Outdoor A/C Disconnect Boxes Have Fuses. There are styles with a Circuit Breaker Switch instead. Thermostat Not Set Correctly. The thermostat has switch that tells the system to Cool OR Heat. 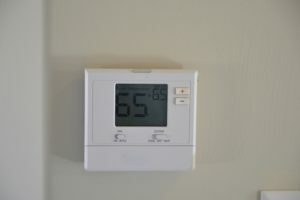 A common central a/c problem results from the the thermostat not set to “Cool” AND / OR the thermostat is not set lower than the indoor temperature. SHOWN: The 3-Position Switch Is Located On The Lower Right Corner Of Thermostat Above. “Cool” will be on one side. “Off” in the center, & “Heat” on the other side. Note: There is another switch for the (blower) fan. It shows “Auto” & “On” settings — leave it set to “Auto” year round. Clogged Drain line One of the most common central a/c problems is a clogged drain line for the removed humidity. As your a/c runs, air is passed over a cold coil (located inside the furnace and not visible). This cold coil removes humidity from the air, which is then drained to the outside. Over Time, It Is Common For An A/C Drain-Line To Become Clogged. If clogged, the drain pan will overflow and cause water to leak out of the furnace at its lowest point. Water is then discharged somewhere within the house. If your a/c is in the attic, you will end up with a wet ceiling. If allowed to continue, mold growth and the risk of the ceiling falling in that area is common. The Easiest Way To Clear A Clogged Central A/C Drain Line Is With A Wet/Dry Vacuum. Find the drain line outside the house. It will likely be near the outside A/C unit. Slip the vacuum hose onto the drain line and temporarily wrap with duct tape to create a somewhat air-right seal. Turn the vacuum on. You will likely hear the vacuum’s sound change as the clog is removed from the drain line. This should take around 30 seconds or less. Click Here To See A Central A/C Drain Line Cleared With Wet/Dry Vacuum: Clear A/C Drain Line With Wet/Dry Vacuum. If your furnace blower motor is running, but there is no air coming from the vents, it’s likely the cooling coil inside the furnace is frozen. To thaw the coil, turn the a/c off by setting the 3-Position Switch to “OFF:. Then set the fan to “on” at the thermostat. This will being to thaw the frozen coil inside the furnace. If air starts to flow from the ducts within 15 minutes, the coil was frozen. Continue to let the fan run (with the a/c turned off) until the air volume from the ducts is what you normally have. At that point, you can turn the fan back to auto and the a/c back on. If unsure, run the fan for 90 minutes. Thermostat set below 70 degrees. NOTE: Keep in mind — turning the thermostat lower does not make the a/c cool faster. It only makes the a/c run longer in order to achieve an excessively low temperature. This often causes a properly working a/c to freeze the indoor cooling coil. A dirty air filter has reduced air-flow too much. If your cooling coil has frozen and the filter is quite dirty. Change the filter and thaw the coil. If the filter is clean and temperature is at 70 or higher, and you have a frozen coil, chances are the a/c is low on refrigerant. This causes it to run too cold which freezes the coil. If low on refrigerant, the coil will continue to freeze. You will need to call for a/c service to recharge the outdoor unit. A frozen coil will damage the a/c system. Is your furnace blower running, but warm air is coming out the vents? First, check to see if the outside unit is running (the furnace blower will run whether the outside a/c unit is running or not). There are several reasons why the outside unit is not running. One reason can be due to no power to the outside unit. We addressed what a typical homeowner can check regarding “no power” issues early in this post. If you have checked those, and they all appear to be ok, it’s time to call an HVAC Technician to troubleshoot and repair what’s wrong. There are many things which can fail. We have outlined the most common failures below. The contactors engage to make an electrical connection at the start of the cooling cycle. Over time, these contactors may fail as a result of normal wear & tear. Failed contactors must be replaced in order for the a/c to run. Failed Capacitor: A Capacitor is a Battery to provide additional electricity to Start a motor running, or Keep a motor running. The Compressor Start Capacitor is responsible for giving the a/c extra electricity at start-up, then reduce the electricity to what is needed while the compressor is running. There are separate capacitors for the compressor, outdoor unit fan, and furnace blower fan. Dirty Outdoor Condenser Coil Needs Cleaned. This coil is located in the outside unit (with the compressor). During normal operation, the coil gets clogged with dirt & debris as a result of pulling in large amounts of unfiltered air to cool the condenser coil. The coil must be cleaned at the beginning of each cooling season for proper operation. If not overly dirty, cleaning can be done with a garden hose with a/c turned off and power disconnected at the outdoor Disconnect Box. If the dirt gets bad enough, an HVAC technician will have to clean the coil with a chemical cleaner. Al’s Plumbing, Heating and Air Conditioning offers an annual A/C Tune Up. At that time, we will tell you if the condenser coil needs cleaned (an extra charge). Dirty Indoor Cooling / Evaporator Coil Needs Cleaned. Residential central air conditioning has an indoor cooling / evaporator coil inside the furnace. As indoor air passes through this coil, the air is cooled and some of the humidity is removed. This coil is wet all the time the a/c is running. Even the best furnace filters allow some contaminants through. Over time, these contaminants get caught in the indoor cooling coil and build up. A dirty evaporator coil is a perfect environment for mold to grow — with the blower motor sending mold-spores all over your home. The coil should be checked annually and cleaned if needed. Sometimes this coil is removed for cleaning. The refrigerant must be removed first, then added back once the cooling coil is cleaned and reinstalled. Your a/c may have leaked refrigerant and is now low. Without the correct amount of refrigerant, your a/c will run, but can’t cool at its peak ability. This leads to higher cooling costs and potential failure of the outdoor unit due to running without enough refrigerant. Refrigerant leaks can happen at any location where refrigerant flows. Refrigerant leaks in the Condenser Coil (outdoor unit) or Cooling / Evaporator Coil (inside the furnace and not visible) may not be able to be repaired at a cost that makes sense given the age & current value of the HVAC System. With an older system, the leaking coil may be replaceable, but not prudent. For newer systems, it may make sense to replace the coil. For leaks in the refrigerant lines (connecting the outdoor unit to the indoor cooling coil) the technician can often repair the leaking refrigerant line and recharge the system with refrigerant. NOTE: If your a/c is older and uses R-22 refrigerant (Freon), recharging it will be expensive and not possible in the future. R-22 / Freon refrigerant is no longer being made (it damages the Ozone-Layer). Remaining supplies of new R-22 are priced quite high, and the only remaining source of additional R-22 is is “reclaimed” (removed from old a/c or refrigerators before they are disposed of).